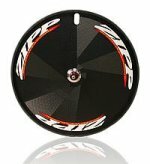 This is the well known and frequently noticed Zipp 900 disc rear wheel, available in tubular and clincher versions. Its just the lightest and most aerodynamic performance wheel on the market, giving rapid acceleration and most importantly speed maintainence. The Zipp 900 remains the frequent most popular disc for many time triallists, track racers and triathletes at the top of their sport. If you are road racing with the possibility of variable surfaces, then of course the clincher version will probably suit you best.